Christine Blasey Ford, who has accused Supreme Court nominee Brett Kavanaugh of sexual assault, has agreed to testify before the Senate Judiciary Committee next week. 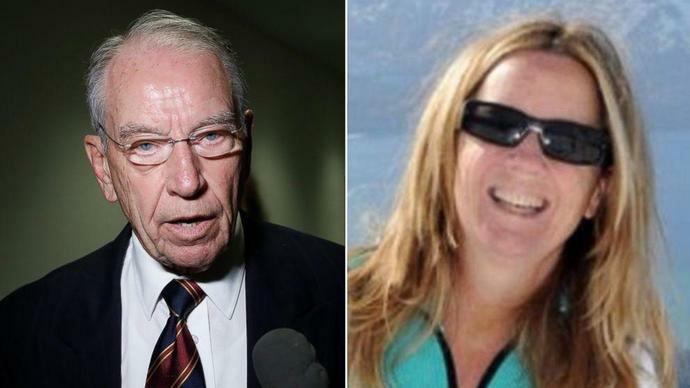 Certain details appear to remain outstanding, including which day Ford will testify -- Thursday, as she had asked for, or Wednesday, which the committee chairman wanted. Ford's lawyers also asked that no outside counsel be allowed to question their client, a reference to GOP members possibly hiring legal staff -- likely women -- to question Ford. Many Republicans are concerned about the optics of an all-male GOP panel questioning Ford. Ford's lawyers wrote in an email Saturday afternoon that she "accepts the committee's request to provide her firsthand knowledge of Brett Kavanaugh's sexual misconduct next week." The email went on to criticize the committee for its proposed conditions as set forward Friday -- including a plan to hold a confirmation vote on Kavanaugh on Monday if an agreement on Ford's testimony wasn't reached -- which Ford's lawyers said "are fundamentally inconsistent with the committee's promise of a fair, impartial investigation into her allegations." "We are disappointed with the leaks and the bullying that have tainted the process. We are hopeful that we can reach agreement on details," the lawyers, Debra S. Katz and Lisa Banks, wrote in Saturday's email, ending with a request to set a time Saturday afternoon "to continue our negotiations." The response from Ford's lawyers came around 2:30 p.m. Saturday, meeting a deadline set by the committee chairman, Sen. Charles Grassley, R-Iowa. However, a senior White House official told ABC News they do not see the letter as any kind of agreement to testify. "Our view is that until there's an agreement there's not an agreement. Judge Kavanaugh agreed to testify and was made available for interviews," the official said on the condition of anonymity. The official said the letter could be "latest delay tactic that they've been attempting," and added that it's a way to continue negotiating. "Let's see how the committee proceeds, but I don't see this as an agreement," the official said. Meanwhile, after the deadline had passed, attorney Michael Bromwich -- who formerly held positions as a former federal prosecutor, inspector general for the Department of Justice, and director for President Obama's Bureau of Ocean Energy Management -- tweeted that had joined Ford's legal team. "I'm honored to joining Debra Katz and Lisa Banks in representing Dr. Ford," he said. Grassley had tweeted Friday night that he had given another extension to Ford "to decide if she wants to proceed with the statement she made last week to testify to the Senate," a reference to Ford's account to The Washington Post on Sunday of the alleged assault by Kavanaugh when the two were teens in the Maryland suburbs in the 1980s. Kavanaugh has categorically denied the allegations and said he stands ready to testify whenever called. The Republican committee chairman also tweeted Friday that he had granted Ford "five extensions" in setting terms for her testimony and he apologized to Kavanaugh, saying he's not normally so indecisive. Katz sent a letter Friday accusing Grassley of setting "aggressive and artificial deadlines" on the negotiations. "It's clear that Republicans are doing all they can to cement another conservative seat on the Supreme Court -- at any cost -- even pushing through a nominee with a cloud of controversy hanging over his head," Sen. Dianne Feinstein of California said. "Brett Kavanaugh could serve on the court for 40 years. What's another 24 hours to make sure we get this right?" she said.